You are here: Home / Game Recaps / 2011 Game Recaps / Kick em when they’re down. Lions maul depleted Eskimos for second win of the year. Kick em when they’re down. 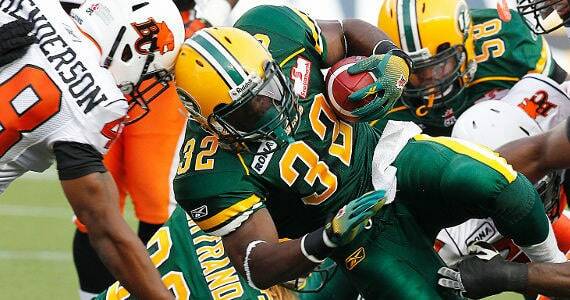 Lions maul depleted Eskimos for second win of the year. The BC Lions knew they had to take care of business tonight against a depleted Edmonton Eskimos squad at Commonwealth Stadium, and take care of business they did. The Lions rolled over the Eskimos picking up their 2nd win of the season. With the win the Lions moved into sole possession of 3rd place in the CFL west and regained the crossover spot from Toronto who also moved to 2-6 the night before. Defence was the story, picking up four interceptions and 8 sacks on the night. Edmonton had no answer for the BC pass rush and without Ricky Ray had little time to get in sync with a makeshift group of receivers that included former Lions Ryan Grice-Mullen and recent cut Dobson Collins. While the Eskimos offence was depleted with injuries their defence also struggled badly. Travis Lulay redeemed himself after poor outing against Winnipeg going 22 of 37 for 343 yards, 4 TD’s and one interception. The offence sputtered on it’s first couple of drives, but got rolling on a great 56 yard catch and run effort by Akeem Foster to put the Lions up 7-0. The Lions built up a 20-1 lead by the half with two Paul McCallum field goals and the first touchdown by Arland Bruce as a BC Lion. Bruce had a great game in his second appearance as a Lion, racking up two touchdowns and 129 yards on 9 catches. Rookie Kierrie Johnson also had a strong game for the Lions. The small but speedy receiver is making the most of his chance to crack the lineup and 6 catches for 84 yards. Johnson would leave the game in the 3rd quarter however with what the team is calling a bruised shoulder. The most impressive part of the win was the fact the Lions kept their foot on the throats of the Eskimos in the second half, keeping the pressure on Ray and moving the ball. Ray eventually gave way to Kerry Joseph who wasn’t much more effective than his predecessor. The Lions defensive line was in the backfield on almost every play and the secondary played with some swagger (sorry Winnipeg) once again. The Lions now head into the bye week on a high and can really get themselves back in the playoff picture with string back to back efforts against the Toronto Argonauts. The Eskimos have given up 18 sacks in the last three games, including eight to the Lions. Geroy Simon passed Darren Flutie to move into 3rd place all-time in receiving yards. His 87th touchdown also ties Willie Flemming for the most in Lions history. The game balls were awarded to Marco Iannuzi (Special Teams), Jacques Chapdelaine (Offence) and Mike Benevides (Defence). Kudos to the Eskimos fans who donated over 109,000 pounds of food for the Purolator Tackle Hunger program, 5,000 more pounds than their Calgary rivals down the highway.